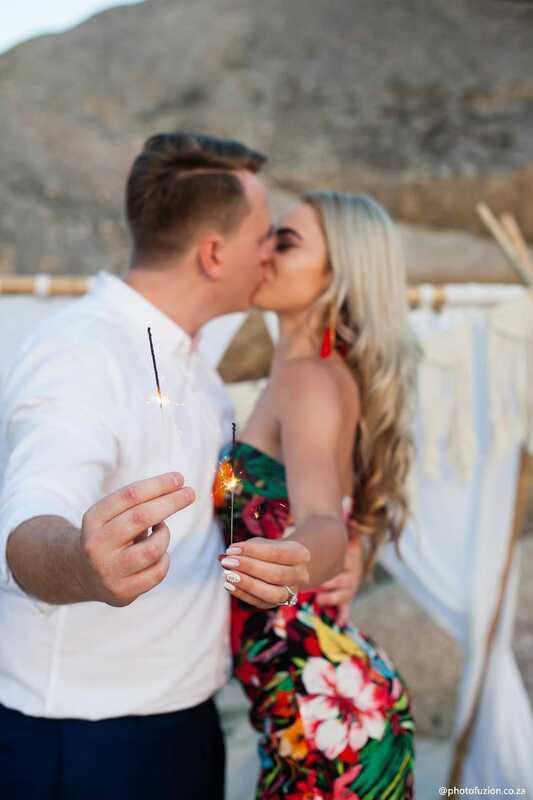 On the 22nd of January 2019, Armand asked Danielle to marry him, and she said yes!! 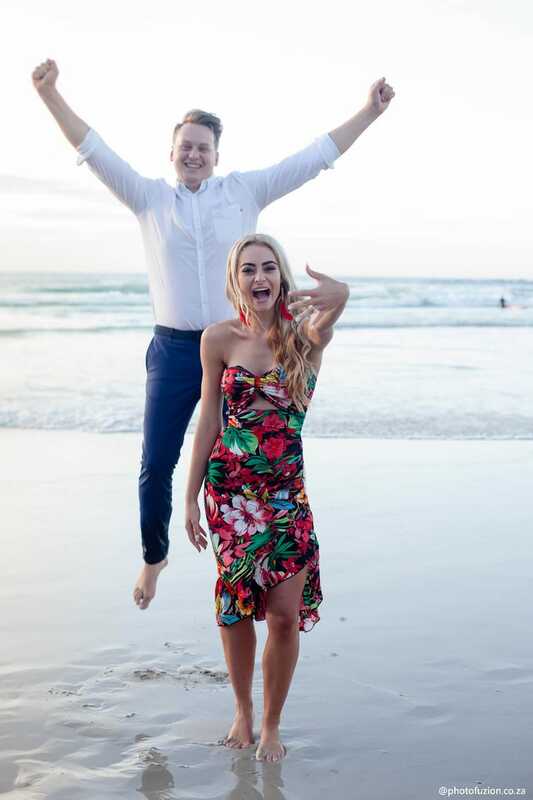 Armand and Danielle have been dating for one and a half years, after meeting in Potchefstroom at an event at Snowflake. They love to eat good food together and both have a great sense of adventure. 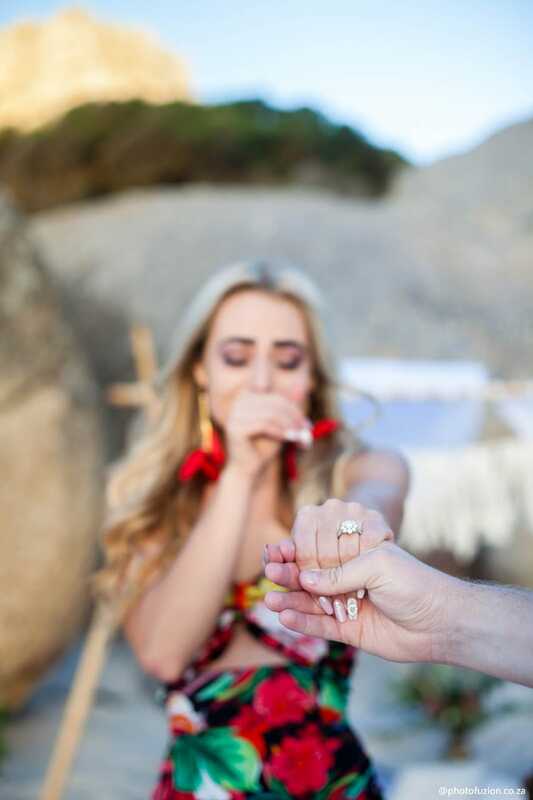 She loves the ocean so Armand wanted to propose to her on the beach and then go for dinner at their favourite restaurant in Hout Bay, Dunes. 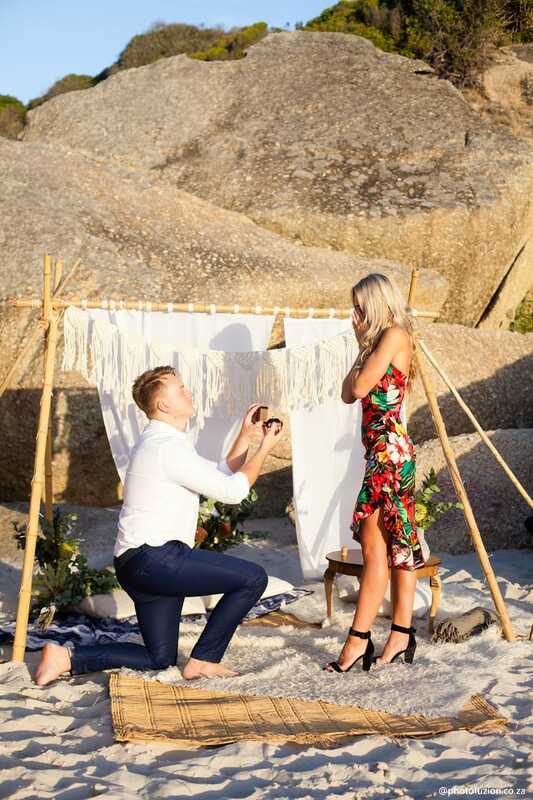 We decided that Llandudno would be the best beach to set up for their proposal. He wanted a Morrocan-style set-up, so we organised for Souk Events to come and set-up a beautiful decor for Armand to propose. 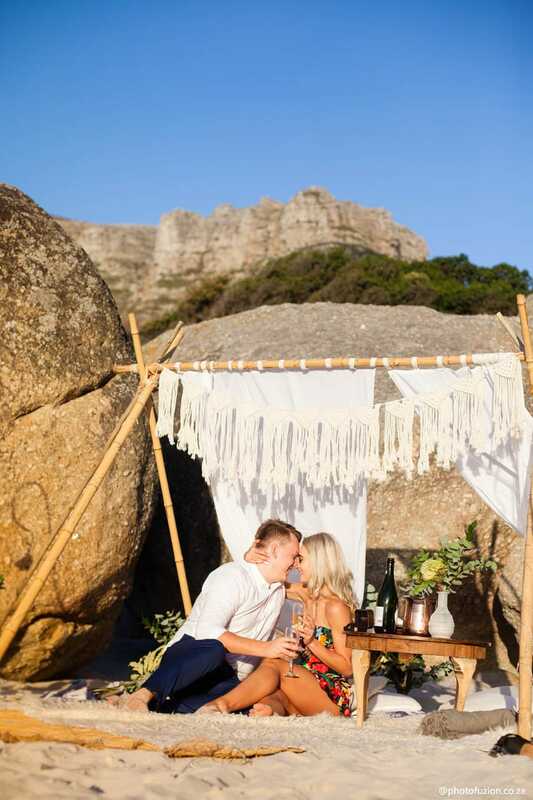 He asked for lots of fairy lights and flowers, so we wrapped fairy lights around the structure of the set-up, and also added lots of greenery and proteas in vases around the set-up as Danielle loves proteas. She also loves rose gold, so we arranged flowers in some rose gold bottles. On their special day, Armand told Danielle they were just going to go for a quick walk on the beach before dinner. 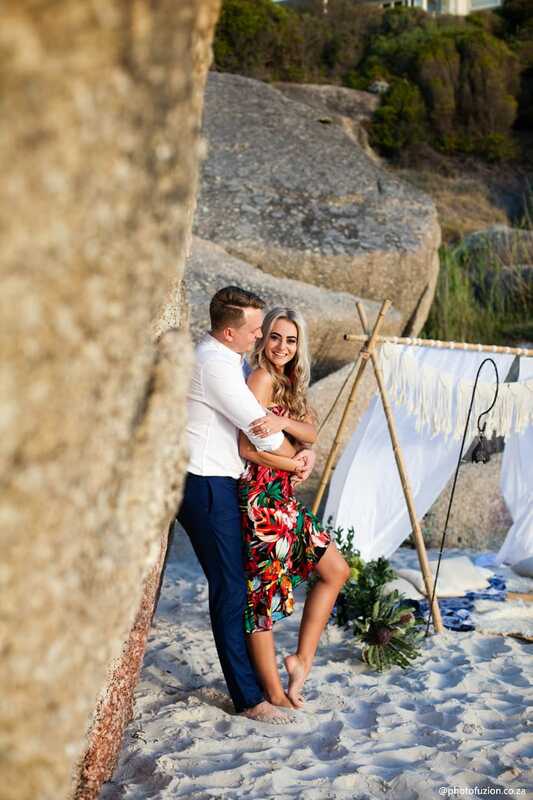 When Danielle walked onto the beach and around the rock with Armand, she was overwhelmed with the set-up and the effort that Armand had gone to! 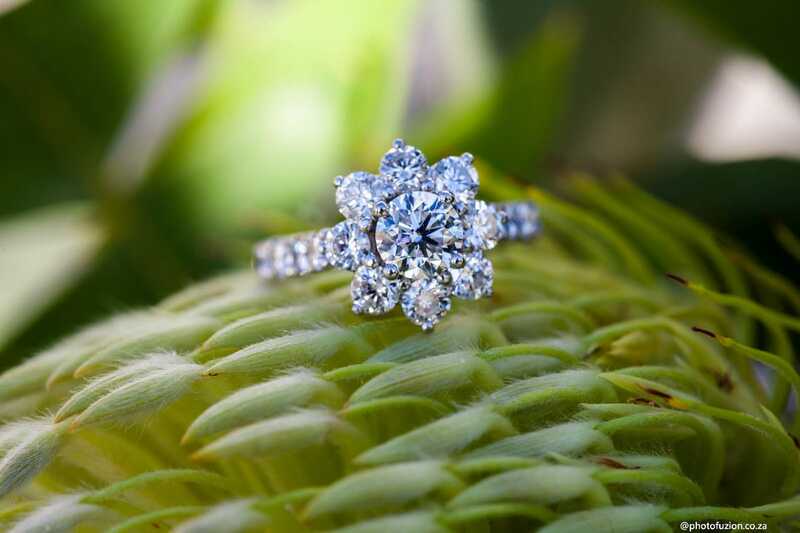 They walked over to the place and after looking around the set-up, he got down on one knee and proposed to her. She had no clue this is what Armand had planned! They then popped some bubbly and had their photo shoot on the beach. Armand and Danielle Moroccan beach picnic was stunning. This was such a lovely couple to work with, they were so happy on the day and loved the space we had created for them. We wish them a very happy future together! For more ideas, to plan yourself, look at our proposal book.